For more than 2,000 years, builders have used travertine as a material for floors, walls, and columns. This natural stone is a favorite among those who choose to give their property an authentic, rustic appearance. Travertine appears to be quite brittle, yet its strength comes from the sedimentary pressure that compressed it. Travertine is available in bulk from Stonexchange, a wholesale importer and distributor located in Florida. We operate a manufacturing facility overseas that cuts the finest quality travertine slabs and tiles from nearby quarries. The stone is then shaped into window sills, floor and wall tiles, borders, and mosaics. Bathrooms are often designed with travertine in mind, and those who need bulk amounts of this material can rely on us for prompt delivery of premium quality stone. The quality of travertine depends on how long the rock was compressed by natural forces. Travertine is actually a form of limestone, exhibiting curious tunnels, cracks, and color imperfections. Hot water from a geyser or spring percolates through the rock, depositing small amounts of contaminant particles in the same manner that builds stalactites and stalagmites. Over tens of thousands of years, a buildup of rock causes compression because of the tremendous weight pressing down from above. The result is an unusual rock, rather hard and yet easy to cut and shape. In the days of the Roman Empire, homes belonging to the wealthy were often covered inside and out with beautiful, rustic travertine tiles. We supply only the finest quality travertine from quarries located overseas. We personally inspect the stone for the amount of contaminant, its degree of hardness, and its coloration. Our customers will receive only the finest travertine tiles and mosaics available. Architects have a lot of fun when designing a custom bathroom that incorporates the use of travertine as a building material. Although this stone is not generally favored as a flooring product because of its somewhat rough texture, honed or polished travertine is perfect for use as a wall surface, soap tray, corner caddy, and for mosaic/border designs and inlays. Building plans often call for shades with names such as Roman, Iroc, Durango Cream, or Chiaro Beige. Our beige-tinted travertine is ivory-medium in shading and works very well for projects specifying the above-mentioned styles. One of the most difficult problems to overcome when designing the bathroom is getting the walls, borders, and window sills to match. We produce travertine tiles, sills, and mosaics that have been cut from the same quarry, and we guarantee color match between these products. Stonexchange operates in partnership with quarries and cutting facilities located overseas. Most of the world’s finest travertine deposits are located in Turkey, which resides in the southern part of Europe, and parts of Asia. We cut all of our slabs into the standard tile sizes, lengths and thickness of window sills, and mosaic configurations. Our travertine is available as either honed/filled or polished. Our mosaics are often made with small pieces of stone that have been specially tumbled in large containers. Our window sills are expertly cut at our overseas manufacturing center and shaped into beautifully designed shields. When customers order in bulk from Stonexchange, we either send the product directly from our Florida warehouse or have it custom-cut and finished at our overseas manufacturing plant. Large orders may take as long as two months to process and deliver, but we offer immediate price quotes on all orders, regardless of size. Customers save money when ordering from a direct importer/distributor. Our company sells product to installers and contractors, large construction companies, home improvement centers and interior design retailers. 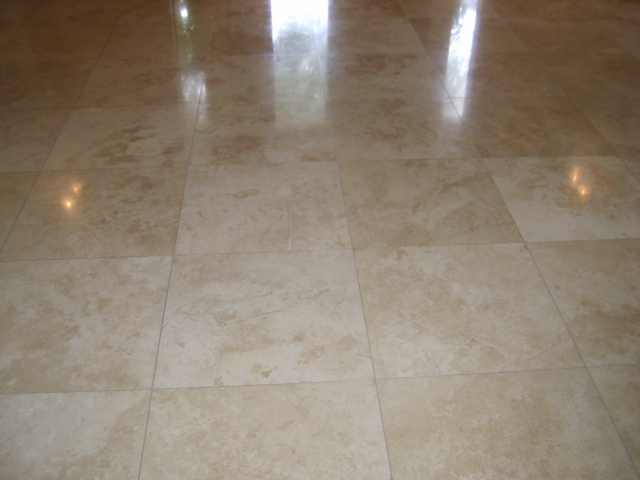 These clients want to maintain a full inventory of polished or honed travertine at all times and have come to rely on us for prompt order filling and delivery. Travertine tiles are generally cut to a standard one-foot square, but orders for larger 18-inch square pieces are not uncommon. Travertine ordered in bulk is often shipped as a crate of larger, rectangular slabs that are cut into the final tile blocks at the job site. Borders and mosaics are one of the most affordable materials for creating a luxurious bathroom design. When perfectly matched with tiles, these borders and mosaics accent various parts of the walls and countertop. Finding the correct shade of travertine can be difficult. Retailers that carry only a single product, such as travertine slabs, may not be able to come up with pieces that match a color block sample. This is why maintaining a full inventory of ivory travertine is essential. We ship full crates or large containers of travertine to our commercial customers on a constant basis. We have a large stock of material at our Miami distribution center, but are more than happy to construct a custom order for tiles, sills, and mosaics. When we fill an order for thousands of pieces of travertine, we specify the sizes in our instructions to the cutting facility. The product is manufactured to exacting standards, packed inside huge crates, and loaded onto a container ship. Once the order arrives at our distribution center, we inspect it for damage, repack the travertine into overland shipping crates, and deliver it directly to the client. Our company stocks all the standard sizes of window sills and tiles. Our travertine sills are expertly cut, sized, and shaped to fit most any bathroom window. We maintain a huge inventory of 74-inch, 56-inch, and 37-inch ivory sills in our distribution center. Widths range from three to twelve inches depending on the length of the sill. Our tiles are cut to a thickness of about 5/8-inch, the standard in the industry. We ship full crates of these slabs to our commercial customers. We can produce non-standard sizes of travertine slabs as well as custom-thickness sills. For large projects calling for the use of non-standard size window sills or extra-thick wall tiles, we require a minimum piece order and will have the pieces cut to specifications at our overseas cutting facility. Contractors can expect a lead time of about 60 days for processing and delivery of non-standard size orders. Stonexchange does not charge extra for these custom orders, so our commercial customers can save money even on the most unusual order requests. Our mosaics can also be custom designed. We carry a large selection of smaller, tumbled pieces that are fitted into rectangular shaped mosaics and borders. These tumbled pieces are often cut from honed/filled slabs. In warmer, southern climates, building and remodeling goes on throughout the winter months. It’s nice to know that a wholesale distributor exists that maintains a full inventory of travertine sills, tiles, and mosaics. We keep thousands of pieces in stock even during the winter months, and our continuous shipments arriving from overseas means that customers needing a large order of travertine will not have to wait for months to receive their supply. Retailers benefit from ordering in bulk because of the cost savings. Besides, having a full inventory of this popular product means that color matching is never a problem. Matching the shade of stock to a sample color block can sometimes be difficult because of the natural patterning seen in large slabs. When hundreds of tiles or sills are kept in inventory, matching the shades between sills, wall tiles, and mosaics is much easier. Contractors rely on a warehouse full of travertine when they receive a large order or have a deadline to meet. It becomes a simple procedure to fill orders for new construction projects where the work is divided into phases. A large condominium complex may be built in two or three phases, with approximately 30 units – and 30 to 60 bathrooms – involved in each phase. This means that a delivery schedule can be set up where three separate shipments of travertine are sent to the client. Each one is large enough that a perfect color match can be made between tiles and sills for each individual bathroom unit. An elegantly designed bathroom lined with travertine walls and containing travertine window sills looks expensive. In reality, constructing a bathroom with travertine is quite affordable when the proper supply source is chosen. A wholesale importer of travertine is the best bet for obtaining the exact color and style needed for the job. At Stonexchange, top-quality honed or polished travertine is not only affordable, it also arrives on schedule as guaranteed by us. We are the premier wholesale distributor of travertine tiles and borders in Florida, and our commercial customers are found throughout the entire United States. Contact us with any questions regarding minimum size orders, custom products, and price estimates. Our superior travertine products are available at the guaranteed lowest prices, and our bulk shipping rates are also unbeatable.